There are numerous ways to climb the 815 metre high colossus of Northumberland, The Cheviot. For many walkers, the straight forward ascent from the delightful Harthope Valley is their first intimate experience of this broad backed mountain. 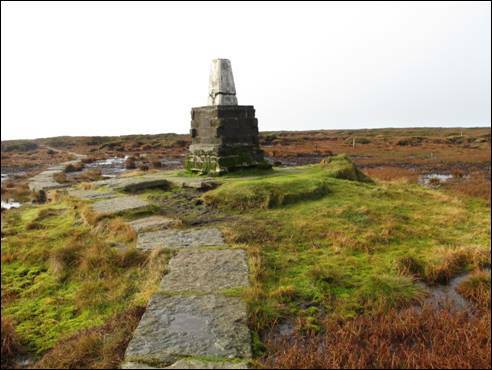 For other walkers, of a more hardy nature, the two mile `there and back` diversion from the main 270 mile long Pennine Way, to the triangulation pillar topped summit, is a necessary evil on the final leg of an energy sapping, blister inducing journey. Those in search of some moderate scrambling will find the exciting route through the ice age cleft of the Henhole a very difficult act to follow. 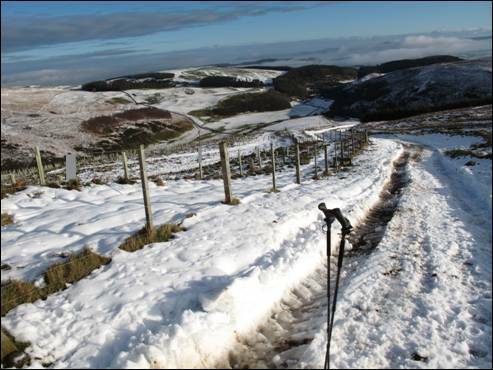 But there are other equally interesting ways to reach the summit of Northumberland`s premier mountain and this walk follows one of those routes. It is a journey with a difference. So load up on the carbohydrates, it is time to venture forth! 1.The stone built town of Wooler, perched high above Wooler Water and close to the northern boundary of Northumberland, is described as `the Gateway to the Cheviots`. From the town`s main street a pleasant journey, along narrow, rambling roads leads to the beautiful and tranquil Harthope Valley. At the bottom of the steep Skirl Naked, just prior to the road bridge over the Carey Burn, there is ample roadside parking (GR NT976250). As you sit here, near to the point where the Carey and Harthope Burns amalgamate to form Coldgate Water, slip your itching feet into your boots and start your walk by heading the short distance to the 1956-built road bridge. Do not go over, instead cross the step stile on your right and walk alongside the fence, ducking beneath overhanging branches, and into the valley of the Carey Burn. Continue with the path and before long the valley starts to narrow and both sides begin to steepen. Soon you will reach a series of small waterfalls, described in William Ford Robertson`s 1926 book, `Walks From Wooler`, as “Careyburn Linn” and “quite a good subject for the camera”. He pointed out that this was “a favourite spot for picnics”. Too early for sandwiches, so continue to follow the burn with the steep `glidder` covered flanks of Hart Heugh, to your right. As the valley turns towards the west, with a small open wooden shelter to your right, the southern, tree fringed slopes of Watch Hill are quickly reached, where the oddly named Hellpath descends diagonally to the burn. When your path merges with the Hellpath, marked by a single post, continue with the burn for a short distance and then cross over the wooden footbridge (GR NT956256). 2. This is the place where the Common and Broadstruthers Burns converge and, after heavy rain, a wonderful spot to experience the power of nature. 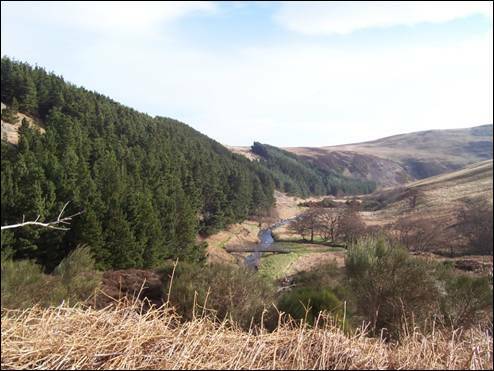 To your right, the Common Burn flows through the narrow defile William Ford Robertson described as “a glen between Watch Hill and Commonburn Shank” and “a pretty place to visit”. In 1926 it was known as “Whiskey Cleugh”, a name which does not appear on any current map of the area. Once across the bridge, the path climbs for a very short distance before leveling out and heading westwards. To your left rises Cold Law, a hill you will climb on your return route. The going, through patches of heather, is easy as the view ahead to Broadstruther and the hills beyond opens up. In time, ignoring the footpath which heads north westwards to Commonburn House, descend a short slope, cross the step stile and then go over the wooden footbridge across the Broadstruther Burn. Climbing out of the shallow valley you meet a gravel track and, turning to the right, you will in a short while arrive at the former shepherd`s house of Broadstruther (GR NT941248). This property was last inhabited in the 1960`s and for many years had been in a semi derelict condition. In September 2006, planning permission was granted to the owners to restore and refurbish the house to provide a single storey shelter for use by shooting parties. None of the existing `rights to roam` are in anyway affected by this decision. 3. There are a plethora of public footpaths radiating from Broadstruther, so be careful to take the path, marked with a directional fingerpost, which leaves the track to your right immediately before reaching Broadstruther. After passing through the trees beside the building this path diagonally crosses the base of Broadhope Hill`s north western slope, heading in a generally south westerly direction. The occasional directional fingerpost points the way. Do not take any side track. Soon the path drops downhill to follow the infant Broadstruther Burn as far as the saddle (GR NT928235) between Broadhope and Preston Hills. You are now 4 miles into your journey and the walking has so far been relatively easy. It is soon to get tougher so be sure to enjoy the next 1½ miles around the head of the quiet Lambden Valley. Continue straight ahead downhill towards the valley passing through the remnants of an old plantation and when a cross track is reached turn left, keeping with this undulating track as it bends around the valley head and across the lower slopes of the mighty Cheviot. Eventually, after passing through a series of five bar gates, the track, which in essence is a forest track, bends to the right and heads rapidly downhill to the remote cottage of Goldscleugh. At this point (GR NT915228) take the rougher track to the left which stays close to the fence as it makes a right angle turn to head steeply up the north `face` of The Cheviot. Now the really hard work begins! 4. Pass through the gate and, as you head upwards, with Bellyside Hill away to your right and Woolhope Crag to your left, you will, in the space of a little less than 1½ miles, climb a total of 1410 feet. You will undoubtedly `need` to pause from time to time to admire the view, which is opening up behind you, and soon the surrounding hills, perhaps crossed on another days walk, will diminish in scale. 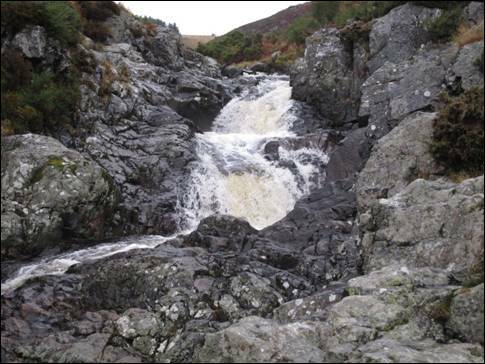 The burn lying to your immediate right is the Goldscleugh Burn which, in the words of William Ford Robertson, “…rises near the Pole of Cheviot and enters the Lambden Burn below the cottage of the same name”-more about `the Pole` later. Beyond Goldscleugh Burn, on the lonely slopes of Bellyside Hill, a Spitfire, operating from Eshott airfield, crashed on the night of the 25th March 1943. The Australian pilot was killed and the aircraft was completely destroyed. Continue to follow the track as it makes its way relentlessly upwards eventually, as the gradient finally begins to ease, passing a stone shelter on your left and then the cairn on the eastern end of the summit plateau near to the ladder stile. On joining the millstone slabbed pathway (GR NT915207), turn right and head the short distance to the summit trig point (GR NT909205), perched on a substantial concrete plinth, high above an ocean of peat. When William Ford Robertson climbed to this, the highest point in Northumberland, a “lightning splintered pole” marked the summit. He said, “the flat top of Cheviot cannot be adequately described” although he did make a valiant attempt. It was, he said, “a vast bog, broken up by great hags, filled in wet seasons with soft black muddy peat to a depth of several feet and, at times, it is impossible to reach the mound on which the Pole stands”. What would he have thought of the present, easy pathway-aided stroll to `the Pole`s` huge concrete replacement? 5. Retrace your footsteps as far as the eastern end of the plateau and then climb over the ladder stile, turning to your left when your feet touch terra firma. The remnants of the stone pathway soon disappear as you begin to head quickly downhill with the boundary fence to your left. Below lies Scald Hill and, beyond, the almost ruler straight Harthope Valley, one of Northumberland`s finest. 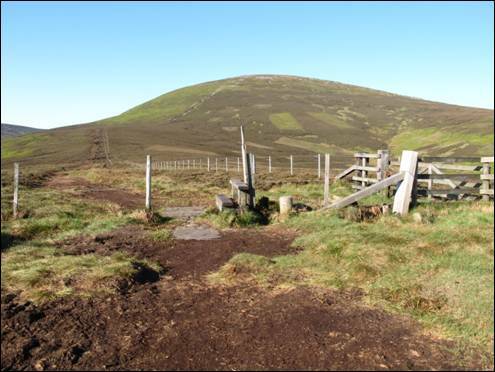 Initially, the descent is steep and stony but soon the gradient begins to ease as you head towards the saddle between The Cheviot and the 549 metre high Scald Hill. Once across the saddle, a short climb brings you to the summit which lies a few metres on the other side of the fence. Here there are good views down into the Lambden Valley and across to Woolhope Crag. Continue with the fence, ignoring in due course the track heading off to your right which leads down to the Harthope Valley, close to the Hawsen Burn. You will remain with the higher ground and the fence for a further 2¼ miles. 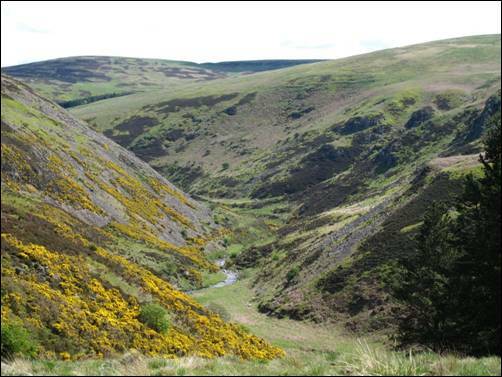 At the 450 metre contour, a sharp dip in the ground marks the watershed of the New Burn as it begins its 1¼ mile eastward journey to the Harthope Burn. In the opposite direction, the infant Lambden Burn begins its 3½ mile trip towards a meeting with the College Burn near to the farmstead of Southernknowe. 6. Out of the dip, you are now heading northwards across heather clad moor towards, but not to the actual summit of, Broadhope Hill. If energy levels permit, a short diversion to the 517 metre high top might just be an attractive proposition. When the fence makes a 90° alteration in its direction of travel (GR NT935233) make sure to pass through the gate and then, with the fence on your right, head sharply downhill. Where the ground levels, the public bridleway, from Broadstruther to the Harthope Valley, cuts across your route and this is a good place to catch your breath before the final climb of the day. Still keeping close to the fence, but having crossed over to other side and turning to your left, it is time to enjoy the relatively easy climb to the top of Cold Law, marked by a triangulation pillar (GR NT953238) just to the east of the fence. 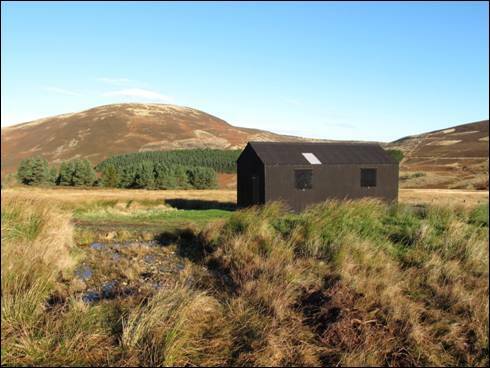 At 452 metres high, and standing along the eastern edge of the Cheviot Hills, this is an excellent 360° viewpoint. Back to the fence, which quickly turns to the north east next to some minor unnamed crags, and keep with this as far as the five bar gate on your left. Go through the gate and, with the fence now on your right, head to the north eastern end of Cold Law, and the prominent Carling Crags. Continue straight ahead for a short distance and, when a track arrives from your left, go over the step stile on your right (GR NT957247). Now begin your descent of Snear Hill, down a generally good green track, in the direction of the Carey Burn Bridge. Spread across these slopes there is evidence of a group of pre-historic hut circles, Bronze Age burial cairns, cultivation terraces and a Roman period settlement. Keep with the winding, downhill track and, when the valley tarmac is reached, turn left across the bridge and before you have time to say “What a great walk that was”, you will be back to your car.